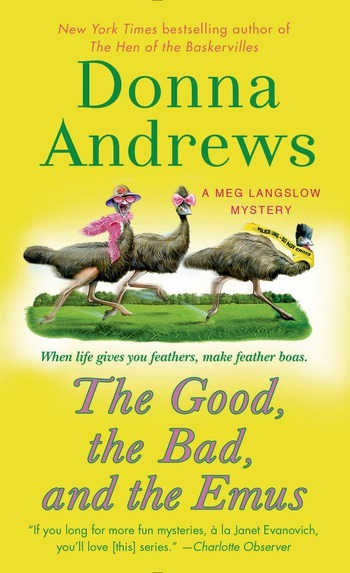 Meg Langslow knows that murder is never pretty. And things are about to take an ugly turn. . .
Stanley and Meg agree to help track down the killer and get justice for Cordelia. Dr. Blake has an idea about how to distract the locals from their investigation: He'll stage a rescue of the feral emus that have escaped from an abandoned local farm. When murder strikes again, Meg suspects that the killer may indeed be among the flock of rescue volunteers...but what now? While her grandfather pursues that lead, Meg continues to investigate both murders with a lot of help from Annabel, who can shed some light on some long-buried family secrets. But will they solve the case before the killer strikes again? "Be careful!" I said, looking up from the boxwood hedge I was pruning. "We don't want another trip to the emergency room. We've used up our family quota for the week."